In this work we address some of the present threats posed to engineering structures in placing them under extreme loading conditions. The common ground for the problems studied herein from the viewpoint of structural integrity is their transient nature characterized by different time scales and the need to evaluate the consequence for a high level of uncertainty in quantifying the cause. The pertinent issues are studied in detail for three different model problems: i) the worstcase scenario of system functioning failure accident in a nuclear power plant causing the loss of cooling liquid, ii) the terrorist attacks brought explosion and impact of large aeroplane on a massive structure, iii) devastating fire and sustained high temperatures effects on massive cellular structures. 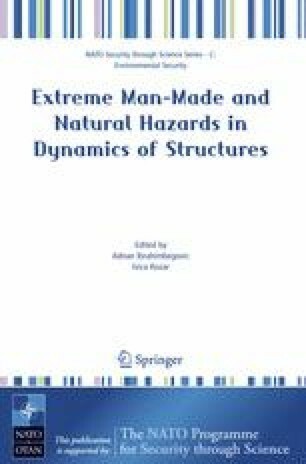 By using these case studies, we discuss the issues related to multi-scale modelling of inelastic damage mechanisms for massive structures, as well as the issues pertaining to the time integration schemes in presence of different scales in time variation of different sub-problems brought by a particular nature of loading (both for a very short and a very long loading duration) and finally the issues related to model reduction seeking to provide an efficient and yet sufficiently reliable basis for parametric studies employed within the framework of a design procedure. Several numerical simulations are presented in order to further illustrate the approaches proposed herein. Concluding remarks are stated regarding the current and future research in this domain.